Maine is a growing solar state in the U.S., with over 13 megawatts of solar installed so far, and the job potential is growing. 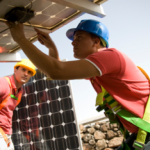 For a skilled professional PV installer there is plenty of opportunity with over 48 solar companies in the solar industry. To find out more about the specifics of solar companies and solar installations you can visit the Solar Energy Industry Association’s (SEIA) website, www.seia.org/state-solar-policy and select your state for in-depth solar installation information specific to your area, or, see the Database of State Incentives for Renewables and Efficiency (DSIRE) at http://www.dsireusa.org/ where you’ll find extensive tax and financial data specific to your state.